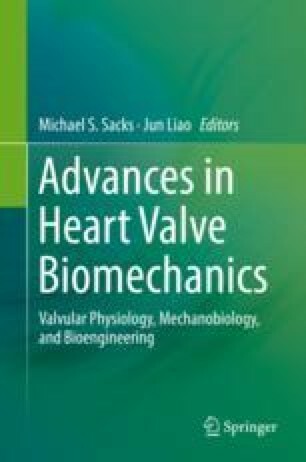 The aortic valve resides in a dynamic mechanical environment, with constant exposure to fluid shear stresses and cyclic strain. These physical forces directly impact the valve endothelium and these cells will regulate the biological response of the valve. Under normal physiological conditions, the endothelium provides a monolayer that protects the valve tissue. However, under abnormal conditions, a cascade of events can lead to a loss of integrity in the endothelium, expression of pro-inflammatory molecules that recruit monocytes to the tissue and paracrine signaling that could cause degradation of the valve tissue and extracellular matrix. Understanding the molecular events caused by changes in the mechanical environment is paramount in the identification of biomolecular markers for disease diagnosis and in the development of novel therapeutic strategies that could alleviate the need for surgical intervention.